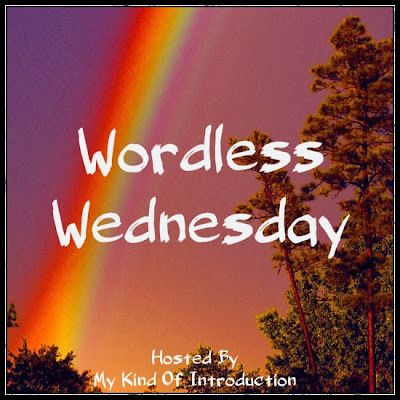 Blogging for Awareness: Asking for help for a Domestic Abuse Victim and her children. I know that it is not October yet but helping others is not just a one month situation. Domestic Violence happens all the time and someone is always in need of help. I had a woman contact me, she told me her story and the fact that it sounds so familiar to me, I have to help her. She is a mother of 2 young kids and is in the process of leaving her extremely abusive husband. Times are tough and since filling reports against her husband, she only has a few days to pack up their belongs and move. Since she is having to leave in such a rush, she's not going to be able to take everything with her. Her kids need clothes and I am determined to do everything that I can to get those babies the clothes they need for the upcoming cold season. I'm asking for your help - I'm looking for clothes for a 4 year old boy and a 4 month old baby girl. If you have anything you can donate to this family in need, it would be greatly appreciated She does not live in my state so I will be mailing the items to her as soon as I get them collected. Thoughts and Prayers are also needed. Abuse is hard to overcome and this brave mama is doing all she can to get her children out of danger. I truly appreciate everyone's help! If you would like to help out and/or join along for my very 1st Awareness Campaign, Please feel free to email your ideas to one of the emails below. I've extremely excited to be spreading awareness for such an important and often overlooked problem that continues to destroy our families. 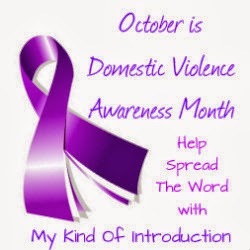 I'm 100% dedicated to Domestic Violence Awareness Month and I look forward to hearing your ides and joining forces to make this Blogging For Awareness campaign a complete success! To Donate to the Domestic Violence Awareness Campaign on My Kind Of Introduction - Simply click the button below - All donations collected will be used to benefit Domestic Violence Services in North Carolina and are greatly appreciated! Moving - Fun or Stressful? Almost 7 million people moved into a new home during 2010.... And my family made up 4 of those people! I have to admit that even though I DO NOT like packing up the whole house and unpacking it just days later, but I do enjoy the feeling of being in a new home. It's very relaxing and fun for me to sit in the middle of my new living room, looking out the windows... taking in our surroundings and dreaming about new adventures. Even though that joy doesn't last very long, the adventures are simply ordinary and your neighbors are strangers, I love it! I'm a quiet girl when I first meet someone and if I'm your new neighbor (or your my newly moved in neighbor) I'll watch you from a distance for a bit before I feel comfortable enough to talk to you. My daughters watch the kids for a bit as well but no where near as long as I do. If my neighbors have kids and my daughters enjoy playing with them... It makes things easier for conversation, but if my neighbors don't have any children and don't come knocking on my door, there's a good chance that I won't be hanging out with them any time soon. Back to the moving ordeal... 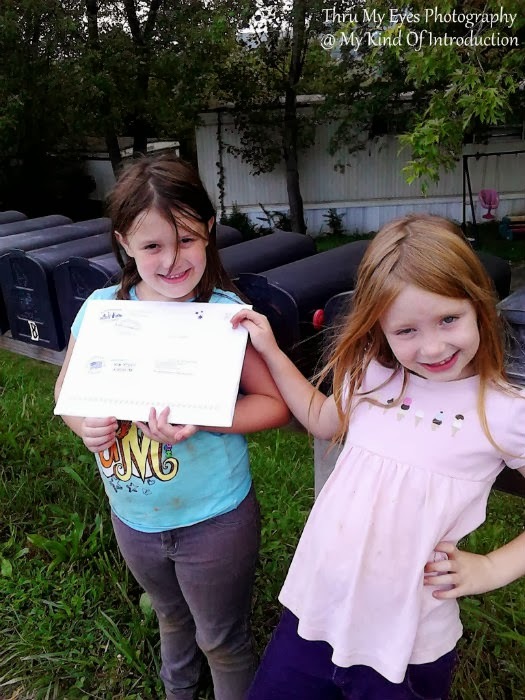 Ever since my daughters were born, my fiance and I have moved atleast once a year except this past year, we've been in the same home for just over 2 years and personally... I'm ready for a change! Some people don't agree with our way of living and say that we are doing things all wrong but it makes us happy. I know many people who have been living in the same home for many many years (like my aunt) and that perfectly fine as well. I'm pretty sure that I could enjoy living in one home for a while as long as it has plenty of room for growth... which is almost ALWAYS our problem. Needing more space is the main reason that I get antsy and begin wanting to move. I've always been a "collector" (maybe a mild hoarder haha j/k) and things get cluttered, messy and crowed when you have 2 growing girls living sharing a room and my step-sons coming and going. It's tough! Maybe I need to take some tips from Martha Stewart!! Picking my brain for my earliest memories... I believe that I moved 9 times as a child... Between the ages of 3 and 16 years old. How many times do you remember moving as a child? Wordless Wednesday - Beach Day! On September 14, my fiance and I decided to take our daughters on a road trip! 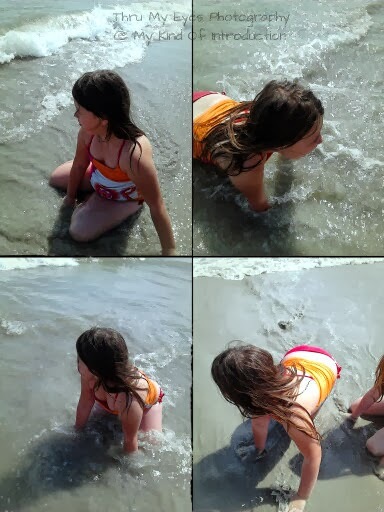 We drove down to North Myrtle Beach SC and had a wonderful Family Day! We didn't stay the night, we drove home... All in one LONG and FUN trip! Here are a few pictures that I took of the girls. The photo's were take with an app on my phone, they are in collage style but were actually taken that way... Scroll down to see what I mean. 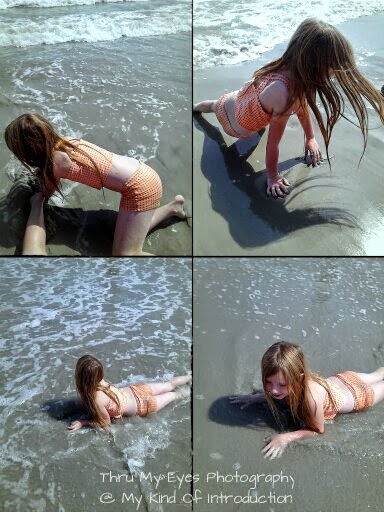 Loran and Jade had a blast! Best Family Day EVER!!! My daughters have been receiving their Little Passports packages for a couple months now and we can't get enough of the wonderful goodies that are inside each package! This is truly the perfect gift for children during the upcoming Holiday Season! Subscriptions are gifts that keep on giving.... What's better than that? If you've been waiting for Little Passports to have a one-of-a-kind sale this year, this is it! Use the promo code FLASH15 at checkout to receive 15% off of your subscription total. What does that mean?? It means that if you buy a 1 year subscription, you'll be paying less than $10 a month (excluding shipping) for 12 months of fun educational activities that are fun for the WHOLE FAMILY! Don't wait another second.., Take a peek at Little Passports today, it is the perfect educational gift for your children, grandchildren and any other special child that's in your life! The packages arrive addressed to the selected child, getting mail is super exciting for kids and once the package is opened..... it's time for the joy of coloring books, stickers, and their very own passport (For the Worldwide Edition, A USA Field Guide comes with the USA Edition)! 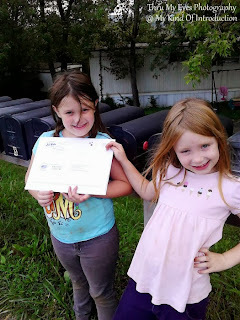 You can even address it to more than one child, our packages come labeled to Loran and Jade! Don't forget to use the promo code: FLASH15 at checkout to receive your special discount and be sure to share this offer with your friends and family! 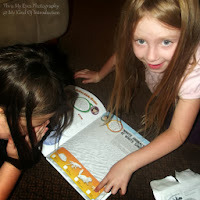 Everyone deserves to have fun while learning!! The FLASH15 code is valid for 15% off all subscriptions, excluding shipping and tax. New subscriptions only. Cannot be combined with other offers. 15% Off total of 3, 6, 12 month subscriptions and 15% off first month on monthly subscriptions only. Back To School items are not eligible for 15% discount. Did you know that you can gift a Free 3-Month Little Passports Subscription to a Teacher when you place an order of $75 or more? 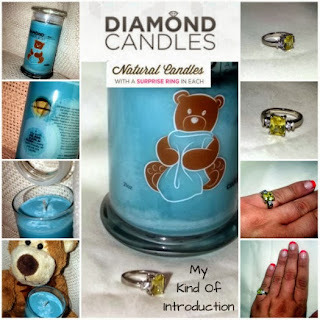 Snag some BLING in the Diamond Candle Giveaway! Enter to win a Diamond Candle of your very own!! 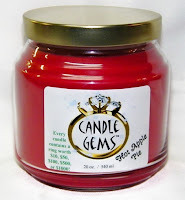 One lucky reader will win a Diamond Candle of their choice!! This Giveaway ends on October 3! I was not compensated for this post and we are not associated with any of the companies named above. The odds of winning are based on the number of entries received. Void where prohibited by law. For military families, it can be tough to find an affordable home near their work. The DoD (Department of Defense) are the ones that you turn to when help is needed. They help military members and their families by providing housing options both on and off base. Service Members with families most often have the option of living on-base in military family housing for no cost to them. Or they can chose to live off-base and receive a monthly housing allowance. Members who are assigned to locations where dependents are not allowed to travel at the governments cost (for example: for basic training, and some overseas assignments) can live in the barracks for free, and still continue to receive the housing allowance in order to provide a home for their family. To live among the military family housing, the service member must be live in the house with his or her dependent(s) as in they spouse and kids. The only exceptions are for those who are deployed, or who are serving a remote overseas tour. The family members can then continue to live in military housing. If single or divorced and have custody of children for at least 1/2 of the year, then they would also qualify. If your married and you and your spouse separate, when they move out of the home with the children (if children are involved), termination of the current family housing agreement will undergo within 60 days. If the you (the military service member) moves out, then your family will lose the military housing within 60 days. Which is not a long time when you actually think about the whole concept of moving a family. Knowing what to expect while planning your move to a military base is very important when a family is involved. Moving can be stressful all on it's on but when it comes to all of the rules from the military, being prepared can make all the difference. I've added a couple resources in-case you find yourself needing more information about the military house options that are available for Military families. Both articles explain the differences of living on and off base along with what to expect, they are full of interesting and useful information that I believe new military families can benefit from and I'm happy to share them with you. Are any of you part of military family and have something to add? Feel free to comment below, I would love to hear your thoughts on the subject. Disclaimer: I received the product(s) mentioned below complimentary from the sponsor in return for my honest thoughts and opinions. All opinions are all my own and may differ from your own. Even though some sort of compensation may have been received, I only write about products that I have personally used and/or believe my readers will enjoy or benefit from. I am disclosing this in accordance with the Federal Trade Commission's16 CFR, Part 255 : "Guides Concerning the Use of Endorsements and Testimonials in Advertising." When I was younger, I was quite the party girl, I went out every night, had more than my fair share of drinks and lost many memories that are sure to be interesting stories if they could be remembered. Now that I'm an adult with kids of my own, I'm not interested in getting drunk for fun, it's not as fun as I remembered. But I do enjoy a small drink every now and then. Just something little to ease the day away, every once in a while. A few nights ago, once all of our company started heading home, my fiance and I decided that we wanted a drink. Not 2 or 3 drinks... just one, kind of like a nightcap. Luckily enough I had recently received a Tequila Tool Box that was full everything we could possibly need to have a good time. That good time would have to wait for another night though, since we were not up for all of that commotion quite yet. 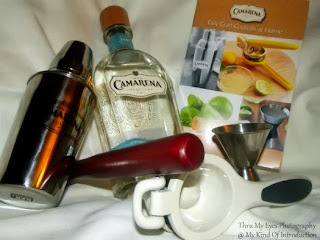 I had Alan make me a Skinny Tequini (without the Skinny), from the directions in the cocktail recipe book. I personally believe that he did a wonderful job! The drink had a very delicious and smooth taste to it and I could faintly taste the tequila without any hint of a burn. My fiance even took a shot of the tequila itself and said that it was very smooth to be tequila and the taste was "not bad at all" which in Alan's words... It was great! 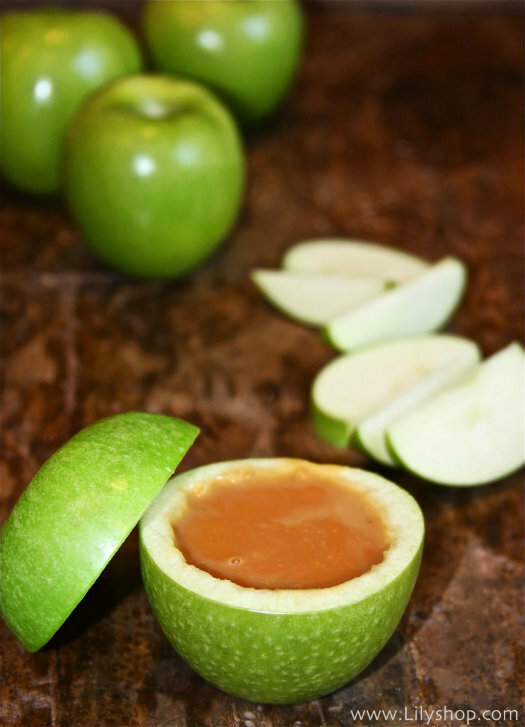 It looks like we found us a new drink to add to our list of enjoyments! My birthday is in less than a month and I still have plenty of tequila left, maybe that good time will happen sooner than I thought... We'll just have to wait and see! 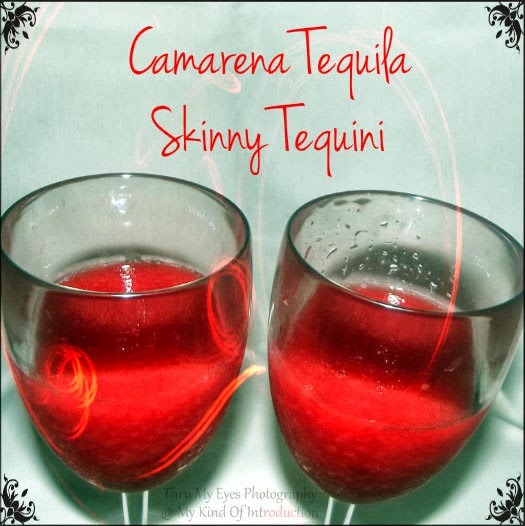 Now you can have your own good time with the recipe for the Skinny Tequila. Let me know how you like it and if you kept the skinny or left it behind like my fiance and I. Combine liquids in cocktail shaker with ice. Shake and strain into a chilled martini glass. 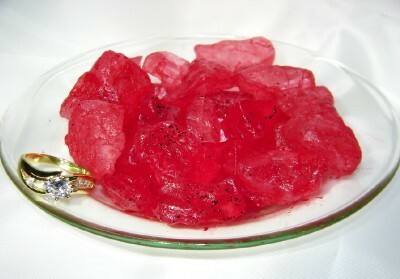 If you would like, Garnish with a lemon wheel. The Light Tequini will be 104 calories... I have no clue what our was since we didn't count calories. If you would like to learn more Camarena Tequila and see what else they may have in store for you... Take a peek at Camarena Tequila Online! While your at it, Why not check out the Calhoun Wine website as well! 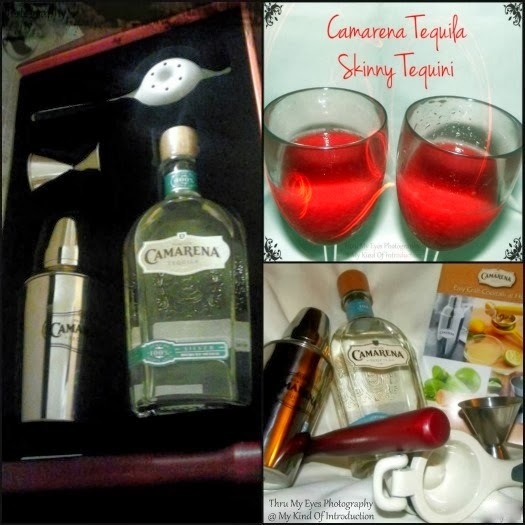 Would you like to win a Camarena Tequila Tipple Toolbox of your very own? I have the wonderful opportunity to host a giveaway for a Camarena Tequila Tipple Toolbox, the only difference in the toolbox that you'll receive is that the Tequila will be replaced with an 11.75 oz bottle of Agave Nectar. You must be 21 or older and live in the US to enter the giveaway. Read the full giveaway rules in the terms and conditions on the form below. The participating bloggers were not compensated for this post. We are not associated with any of the companies named above. Void where prohibited by law. Since I'm a mother and I've seen first hand, what can happen when someone abuses alcohol, I wanted to make sure that I ask for you all to be safe when you drink. Don't get behind the wheel of a vehicle if you have had ANY alcohol to drink. One drink is too much if you have to drive home!! I would also like to add that drinking has it's limits and once a person passes that line, bad things can happen. Anger can flair, your memory can leave you and that's only the beginning. People can get hurt and that's the last thing someone wants to think about when they're sobering up and realize what happened when they was under the influence of too much alcohol. 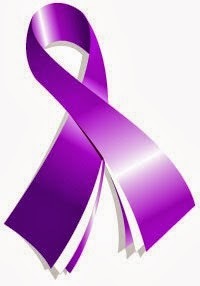 Next month is Domestic Violence Awareness Month and I will be talking more about this subject. I would love for you to join me and help spread the word against Domestic Violence Awareness! Get your Plane Labels TODAY! 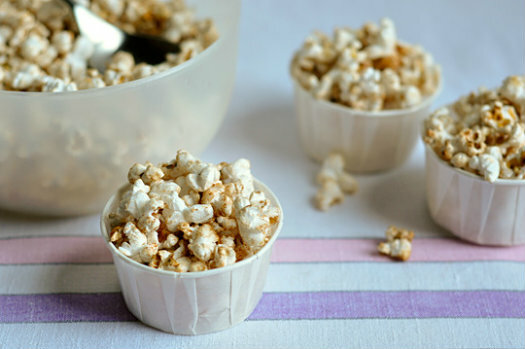 Mabel's Labels is offering a great 50% off promotion! On n 9/20, Mabel's Labels is offering 50% off Plane Sticky Labels in the first ever Talk Like a Pilot Day created by Mabel's Labels. You can NEVER have enough labels and these plane labels are perfect for that special little boy in your life!! 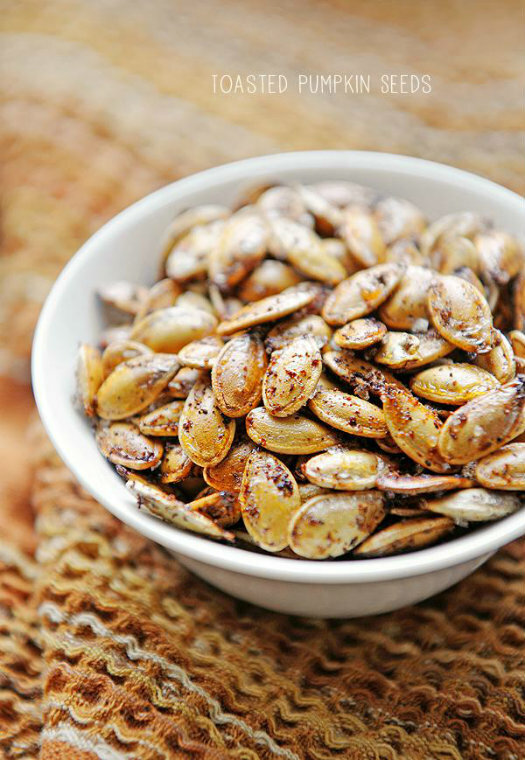 It's that time again... FALL! 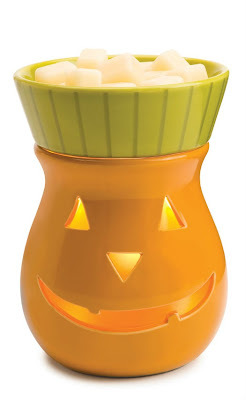 It's time for Halloween items to start popping up in stores, as well as and SoyL Scents is no different! We couldn't miss out on all the spooky fun! Limited Edition Candle Gem Candy Corn! This soy candle is made with three-layers. The fragrances are: White ~ Candy Corn, Orange ~ Creamy Caramel and Yellow ~ Autumn Splendor. It's like 3 candles in 1! 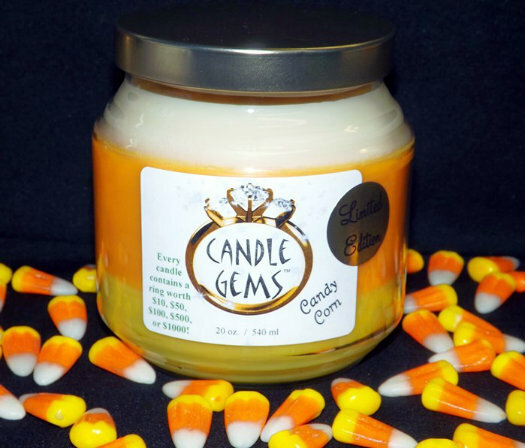 The Candy Corn Candle Gem will only be available until November 1st so make sure you place your orders soon so you can enjoy the sweet Candy Corn scent in your home! I can't get enough of this smiling Jack-O-Lantern! It's the perfect edition to any Halloween set up. 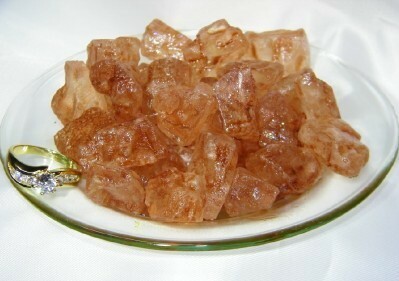 Not only would this melter look great on top the mantle, it will also make a cute center piece on the coffee table! 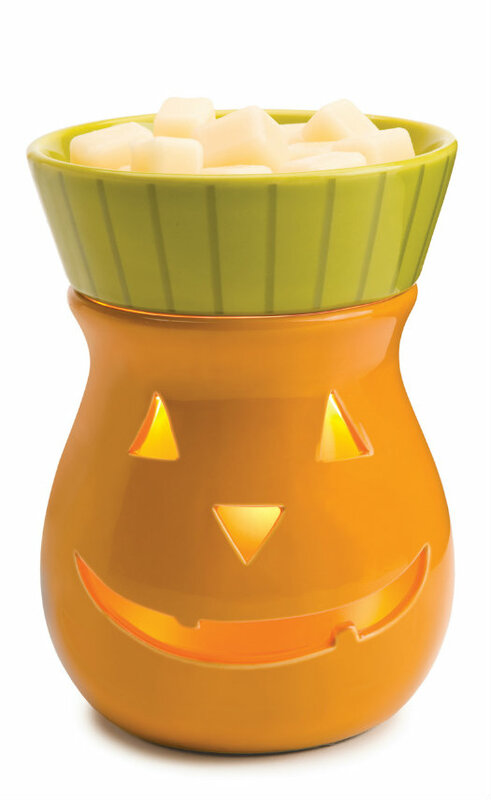 The Jack-O-Lantern Full Sized Melter is part of the SoyL Scents Halloween Collection. I'm not 100% sure it's a Limited Edition like the Candy Corn Candle Gem Candle but if so, we will stop selling it on November 1st! Snag you one of these cute melters while you still can! 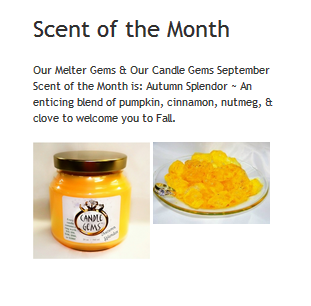 Each month, SoyL Scents had a Scent of the Month for our Candle Gems and Melter Gems. 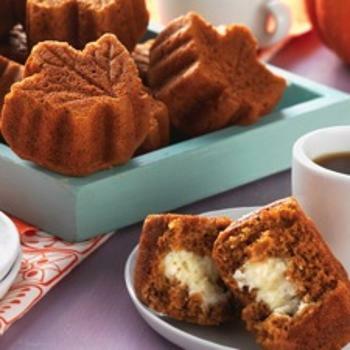 During the month of September, the Scent of the Month is Autumn Splendor with the perfect blend of pumpkin, cinnamon, nutmeg, & clove to welcome you in to the Fall Season. Don't forget about the ring that you receive in EACH Candle Gem and Melter Gem package! The rings can be worth either $10, $50, $100, $500, $1000. 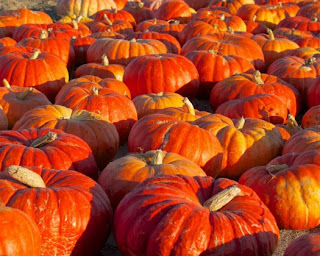 Some of our scents are perfect for the Fall Season so I decided that I would make a list of our Fall-Like scents so you can pick the perfect one for your home! A ring in each 22oz package! 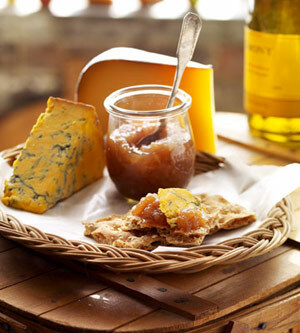 A nutty bouquet with maple butter, cinnamon and clove with a syrupy sweet background. 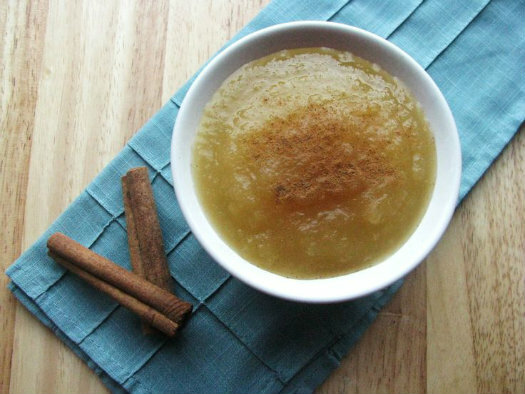 Warm, bakery aroma of a fresh from the oven spicy apple pie. Don't they all sound divine? Let me be Your Personal Consultant and help fill your home with many wondrous scents! Visit my SoyL Scents Website via the link below! It's time to "Clean Up" With Fall Savings from Tractor Supply! Now through Monday, September 23, You can reap the huge savings on big ticket items like gun safes, chainsaws, truck tool boxes and more! 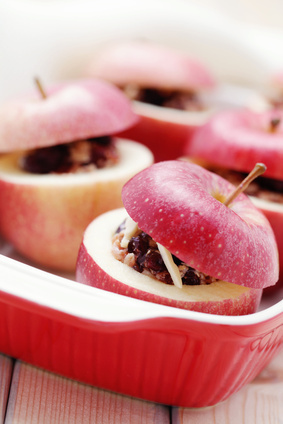 This is perfect for the upcoming Holiday Season! If you like to start your shopping early, then this is the perfect Sale for you to make the man in your life happy! Check out what all is on sale below! SAVE $20 On ShelterLogic Pop Up Pro Canopy Factory 10 ft. x 10 ft.
Disclaimer: I received the product mentioned below for free, in return for the following review. Even though some sort of compensation has been received, I only write about products that I used and/or believe my readers will enjoy or benefit from. I always give my honest opinion which may differ from your own. 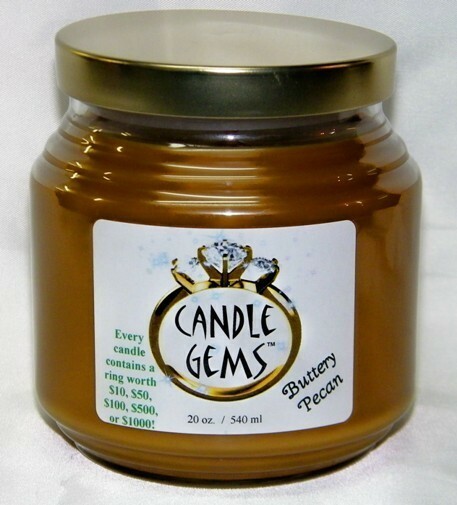 What's better than receiving a bran'-new candle and once you get about half way through burning the candle, you find a beautiful ring wrapped in gold foil that could be worth up to $5,000!? That's exactly what happens when you order one of the many scents of Diamond Candles! I recently got the opportunity to review one of these wonderful candles and I couldn't of been more excited! My mama has always been a big fan of candles and a bit of that addiction rubbed off on me. 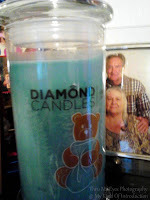 The scent that I chose was "Cuddle", a blue candle that was said to have a baby powder scent with a slight twist. When I received my candle, the first thing I did was turn it around so I could see the gold circle stuck to the inside of my candle... the ring! The only way to get to it was to burn the candle and that's exactly what I set off to do. As soon as I lit the candle and the wax started melting, the relaxing scent of baby powder filled my living room! It truly did remind me of snuggling up in a warm blanket on a snow day, just like the description said. A couple nights later, I did something that is very dangerous and unresponsible of me... I fell asleep before I blew out my candle! I woke up at around 3am and realized quickly that the smell of baby powder was way too strong to have been blown out hours ago! To my surprise, when I arrived at my bookshelf where the candle was sitting, it was barley half way burnt down and the flame was safely flickering in the jar! I'm sooo glad that the jars these Diamond Candles are in, are made thick and didn't crack from the hot flame burning for so long, I'm one lucky Momma! It didn't take long before the ring was showing through the candle and I sadly didn't get the chance to retrieve it myself.... I woke up one morning to my bathroom smelling strong of baby powder and and the gold wrapper and tiny bag laying on the counter. I knew right away what had happened and headed to the living room to find the girls. They were sitting in the floor watching Netflix, the candle was back in it's original spot and the ring was in the palm of Loran's hand. Her face was full of joy that she had found a pretty ring in mommy's candle. Don't miss out on the wonderful giveaway! You can win a Diamond Candle of your very own!! Are you expecting a new baby soon? American Baby has just the information that you'll need. We all know that each pregnancy is different as well as each baby. No two children turn out the same and the struggles that you dealt with your first child... May be completely different this go around. That's why I'm super excited to be offering you this FREE magazine subscription for American Baby! safety issues to the latest baby products for your new baby. The amount of magazines you will receive all depends on the Pregnancy Due Date that you provide! I have a wonderful offer for you today! 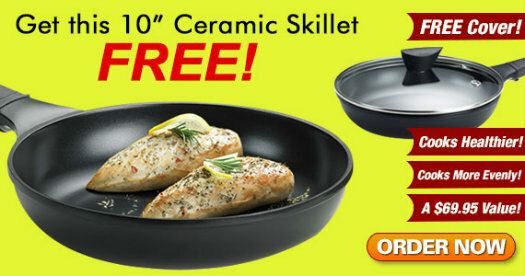 Receive a FREE Ceramic Skillet worth $79.95!! Click HERE to snag this wonderful deal before it's too late! *SUPER HOT! * The UPS MyChoice Pick-A-Package Instant Win Game! Win LOTS of Amazon Gift Cards! Have you been trying to figure out where that extra cash is going to come from to afford your family's growing Holiday Lists? My Oh My - Don't I have something wonderful in store for you!?! Just in time for the busy Holidays, the UPS MyChoice Pick-A-Package Instant Win Game is rewarding people by the "bus loads"! You can win all kinds of Amazon gift cards as well as many more wonderful prizes! I figured it was worth a shot, What do I have to lose? My friend Donna has already won over $1700 worth of gift cards and prizes! It's amazing!! Want to know how to get your hands on some of those winnings? Click the following link -> CLICK ME!!!! to start playing right away!! You will receive more game plays by inviting your friends to play! It's possible for everyone to be a winner!! Don't forget to stop back by and let us know what you won! Make sure you click the PLAY NOW button BEFORE the site redirects you to another page. The game play button will look like the one below. Once your there, Log In via Facebook and the game should appear. The more friends you invite, the more chances you get to WIN!!!! 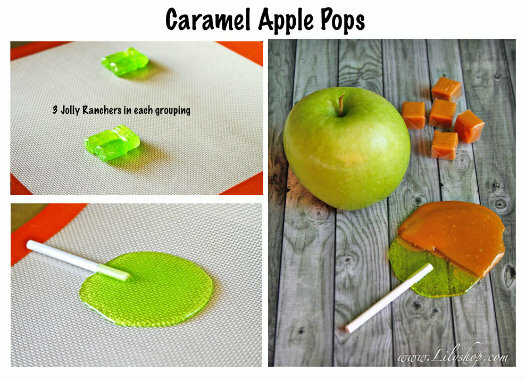 It's as simple as pie and soooo worth the small amount of time it takes to play!.... My friend Jen just won a $50 Amazon card through the UPS MyChoice Pick-A-Package Instant Win Game!! Make a Bold Statement in your home with Palu! Are you looking for that one piece of furniture that grabs the eye of each visitor as they walk into your house? If so, then you must check out Palu! Delicately designed with beautiful details and being effortlessly classic, the Palu furnishing line embraces quality materials, fine craftsmanship and singular design for pieces that are not only eye-catchers but they truly stand the test of time. Within the line includes chairs, beds, dressers and so much more. The pieces feature anything from natural wood to textured materials, the versatile collection is just as much elegant and refined as it is modern and noticeable. From now through October 15th, Zinc Door is offering 15% off Palu furnishing when using the promo code PALU15!! Don't miss your chance to save on this fabulous collection today! This deal won't be around forever and I'm sure you'll regret it if you don't take advantage now! So what are you waiting on?? Lets see what all Zinc Door and Palu have in store for you! 2 for $10 Graphic Tees and Leggings for Kids - Plus Much more! It's time to go SHOPPING!!!! Now's the perfect time to stock up on those much needed tees, pants, leggings and such, during the big $10 Deals sale at Crazy 8! Don't miss your chance to get wonderful deals on adorable outfits for each and every child in your life. This is an amazing sale that you don't want to miss out on! Offer is valid for a limited time only, while supplies last. Be sure to check out Crazy 8 today! Did you know that this Sunday, September 22 is the First Day of Autumn aka the Fall Season?! So soon, right! Trust me, I feel your pain. School time is well on it's way and I'm almost certain that all of you mom's out there are struggling with after-school snacks, aren't 'cha? I struggle every day and I regret the days that I give in and toss my girls sugary snacks when I'm in a hurry and can't quite put a healthy snack together in time for what ever comes next in our life. 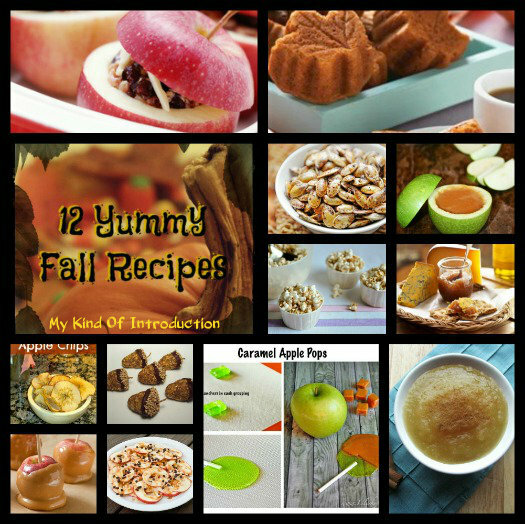 I've searched far and wide for the most delicious fall recipes that will make any school day better! 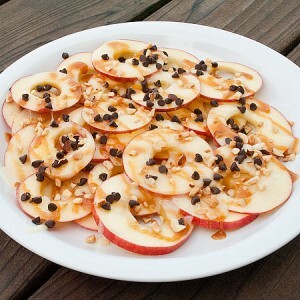 The Prep Time for all of these recipes are also listed below! 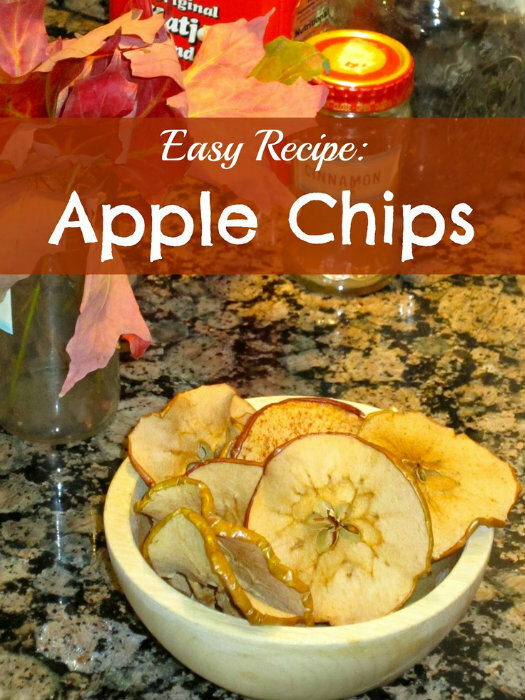 Apple Chips from What Do We Do All Day? Cherish Childhood.... It doesn't last forever! 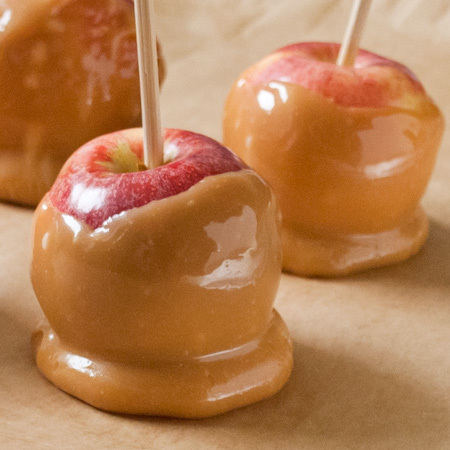 Keeping your hands out of the candy jar! Purchase Holiday Photo-books Now and Save!